From Hong Kong we took a ferry to the country/island of Macau which is a Chinese/portuguese place. The ferry took an hour then we got a bus into town. We got off at the famous avenue de almeda ribiero and walked to our hotel. We got a really cheap deal in a great location. The San va hotel was an old Chinese house, the receptionist was rude and gave us the wrong room then pretended not to understand English anymore. The room was old and not nice but the showers were decent and free drinking water outside the room. 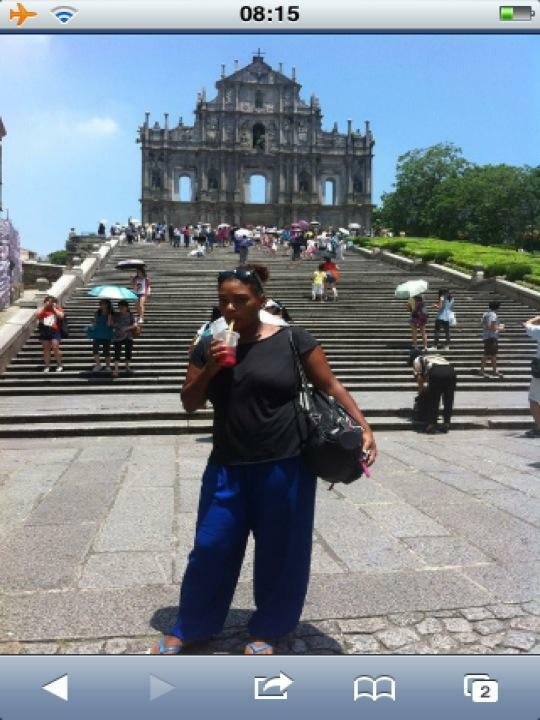 We only stayed 1 night and spent 2 days in Macau. The first day we had a little walk as we do then had some Macanese food which was average. We took a bus to the world famous Venetian hotel casino. The outside looked so nice with a canal all around. As we went inside we were blown away. It was massive and really gold. The place is an attraction on its own. It had a shopping mall, food court, restaurants, casino and rooms. We spent the whole afternoon there. Had the best egg tarts and had a go in the casino haha. We watched some dancers perform and walked around the mall which was based around an indoor canal with a fake sky. We loved it. We had a drink at the lisboa casino, sat at the bar and there were more dancers performing (not good ones tho). The next morning we headed out early. We walked around the whole place. We saw so many churches including st lawrence, st dominic, st augustine etc it was different because we were so used to seeing temples. There was so much history to this place. We saw an old theatre, mandarins house, Sendai square was beautiful and so clean. We went to camoes garden which was a beautiful park, had more egg tarts too. We went to an old cemetery, saw the famous st Paul's ruins and spent time in the Macau museum which was really interesting and free on the 15th of the month which was the day we went.. Bonus. We had a tiring day but really fulfilling time in Macau. We got the bus back to the ferry terminal and saw the Macau tower along the way. The ferry had engine problem so we had to go back to Macau and change ferries. The Chinese tourists were so dramatic it was hilarious watching. As we were delayed they gave us Oreos each and a drink which was good. We also got a voucher for discount travel on the ferry for next time. Macau was a really great, historical, cultural place and we really enjoyed it.